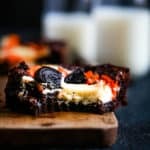 These Pumpkin Spice Oreo Cheesecake Brownies are a decadent chocolate treat with the warmth of autumn spices. In a medium saucepan over low heat, melt butter. Stir in baking cocoa and coffee. Add sugar, eggs and pumpkin spice extract to saucepan and stir to combine. Pour batter into greased 9" x 13" pan. In a medium bowl, add cream cheese. Using an electric mixer on medium speed, beat until smooth. Add sugar, pumpkin spice extract and egg and mix until combined. Spoon cheesecake topping in large dollops over brownie batter, leaving some batter visible. Sprinkle surface of brownies with crumbled Oreos. Let cool completely prior to serving.